We brought Ruby home Sunday (Oct 5) after lunch. I ordered a giant meal for Lunch that I shared with hubby and then we skedaddled out of that place so fast! I loved the nurses I had while I was there, but I hate hospital beds and I was ready to get back to my comfy house and boys. 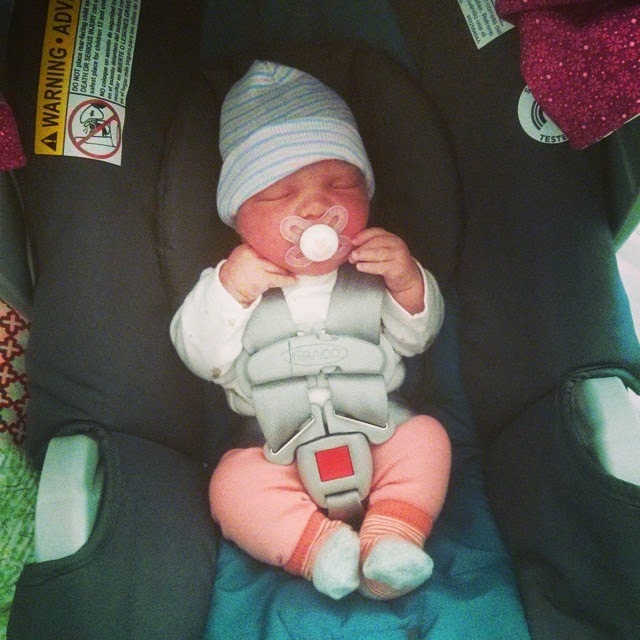 So round and cute in her carseat! The Kitty meets Ruby for the first time! He was twice her size! He didn’t seem to care either way. He sniffed her new car seat and walked away. She said “She likes me and she’s going to keep me forever!” My other nephew took a turn, but once I got the picture he was ready to hand her back asap! Sam disappeared for a while and I found him on our bed conked out. When he woke up we kept with tradition and let the boys open gifts from the new baby. Ruby got Luke a transformer and Sam a hexbug track.